If you had all the correct products at hand would you be more willing to D.I.Y? April I turned myself onto the Ombre craze - felt I missed out on some kind of 'hair craze' after the whole half head / quarter head shaving do that I was never going to have enough balls for. The ombre do for me was a trial and error or is that trial and horror! People have asked me questions re 'how did I do it?' 'what shade did I use?' and etc. That had me wanting Ombre hair even more especially after I had to cut it after my first attempt to have it feeling a little bit more 'fresh'. My hair surprisingly wasn't damaged as much as I thought it could of been while doing it but after every colour in put I trim it. My second attempt was my kept attempt after I had put an all over colour of Clairol 10 Medium Ash Brown I left it a few weeks and went back to work. Learning from the first time it worked out and a few months on I've kept the style - up-keeping the blonde is a pain in the A if you ask me. Let's just put it this way in 4 months my hair had more colours running through the layers I gave the Rainbow a true run for it's nursery rhyme. The boxes and money spent - yes D.I.Y. is cheaper but calculating it all up and the up keep can become an expense. 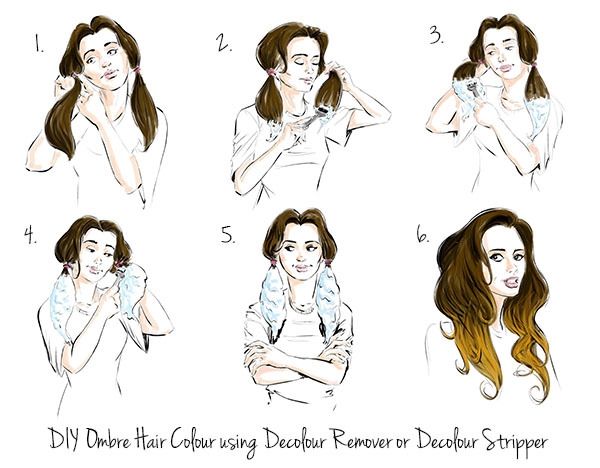 Scott Cornwall is a hair expert and he has put together a step by step guide on doing ombre hair at home. If you currently have a dark hair colour, you can use a Decolour product to ombre your hair with no extra hair colouring. If you have dyed dark hair with a lighter base underneath, you can use Decolour Remover to remove just the artificial dye. If you are working on a naturally dark colour, use Decolour Stripper to remove artificial and natural colour from your hair. If you are looking to add a fashion colour to your ombre such as red or pink with a chosen hair dye and are looking to create a light base for a more vibrant outcome, use Decolour Stripper to remove natural and artificial colour. If want a dark colour on top and lighter ombre tips, you will need to dye your hair a darker shade all over and use Decolour Remover to remove the artificial colour only from the chosen ombre area. All hair treatments and colours work best on clarified hair, so wash your hair with a clarifying shampoo a few washes prior to treatment. 1.Work with towel dried hair pulled into two ponytails. TOP TIP: Rather than mixing the product in the supplied bottles, combine them in a tint bowl for 1 minute, you may not require the whole mixture. 2.Using the suitable Decolour product (see above), use the tint brush to apply the product to the ends only. Allow to develop for 10 minutes. 3.Now apply the Decolour to the next section of hair and leave for 10 minutes, continue this process until the desired result has been achieved. 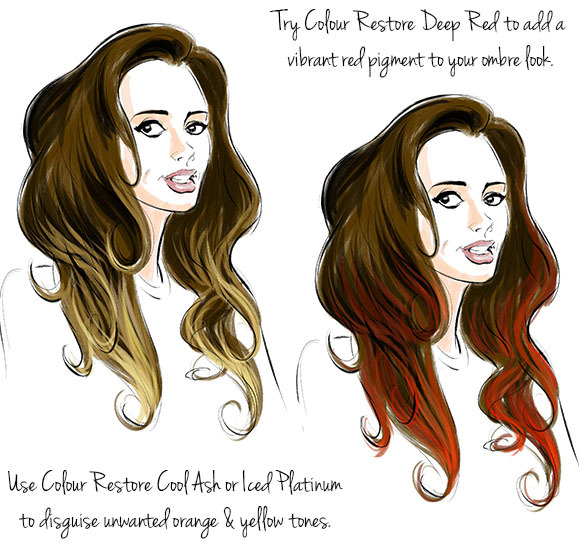 Applying in stages will help to achieve the dip dyed or fading out effect. 4.Leave Decolour on for a further 10 minutes to develop to the desired results. 5.Reapply Decolour to the entire length of hair to even out application, leave to develop based on personal removal requirements, see pack instructions. 6. Rinse and apply the Conclude Balm or continue to use the Colour Restore product of choice. Want to enhance your at home ombre hair? You could apply a fashion colour of your choice or use Colour Restore to improve and maintain your ombre colour. Colour Restore Cool Ash can be used to remove unwanted orange tones, Colour Restore Iced Platinum to remove unwanted yellow tones and Colour Restore Deep Red can be used to add a vibrant red pigment to your ombre. 1.Rinse out the Decolour product and apply the Colour Restore shade of your choice like a conditioner, before rinsing towel dry and reapply Colour Restore and allow to develop as instructed. 2.Rinse and dry as desired. Are you still feeling the ombre vibe?